The United States Electoral College is a name used to describe the official 535 Presidential electors who come together every four years during the presidential election to give their official votes for President and Vice President of the United States, usually voting for the popular vote (most voted for person) during the election of the state (or federal district, if they are from Washington, D.C.) that they are from, but in some states, they vote depending on the popular vote in each congressional district. Faithless electors are electors that vote against the popular vote, although there is a fine for this in some states. The Electoral College was established by the Founding Fathers of the United States as a compromise between election of the president by Congress and election by popular vote. 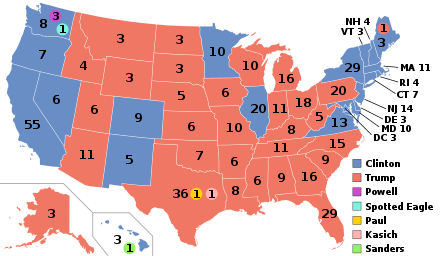 A census is conducted every 10 years to determine the number of electoral votes for each state. Originally, electors voted for two candidates and the people with the two highest vote totals would be elected President and Vice-President. That did not work very well, so today the President and Vice-President are elected on separate ballots. In order to win in the Electoral College, a candidate needs 270 votes. If there is no winner in the Electoral College, the House of Representatives elects the President and the Senate elects the Vice-President. This page was last changed on 21 March 2019, at 16:07.